Doug: I tried all the traditional ways to meet people and they hadn’t worked for me. You know – the gym, library, bars, the workplace, chance encounters, Craigslist, subway, Match, Lavalife, MySpace, Meetup, J-Date, Second Life, street festivals, Obama rallies and the like. But then I saw this urine-stained advertisement printed on a semi-adhesive piece of paper and haphazardly slapped on the bottom of a light pole mount. It occurred to me that I hadn’t tried them yet. Well, I’m unemployed and don’t have a pen, so I had a dilemma – do I just take the urine-stained advertisement printed on a semi-adhesive piece of paper and haphazardly slapped on the bottom of a light pole mount, or do I try and memorize the website address so that when I get to Tasti Delite I can log on and try them out? What did you ultimately decide? I memorized it using a technique I think I heard about called “association.” First I memorized NYC because that’s where my halfway house is located. Second, I memorized singles because it’s what I am, and I like Kraft cheese singles – especially the peeling away of the cellophane for every individual slice. And then I had to remember the dot-thing. Now, most businesses are dot-com, but these guys aren’t. 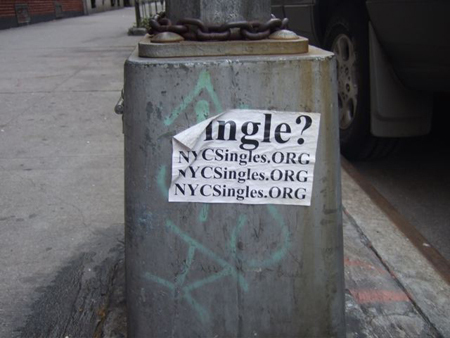 So I just remembered them by thinking “What organization advertises themselves via urine-stained advertisement printed on a semi-adhesive piece of paper and haphazardly slapped on the bottom of a light pole mount?” That seemed to work wonders. I sat down, ordered a large Chemical Chocolate flavor Tasti Delite, and logged on. They asked for a phone number I could be reached at, like they used to do in 1991 before email and stuff helped expedite things. So I gave them the number of the payphone outside my halfway house. Luckily for me Verizon had just repaired the receiver which had been shattered weeks earlier by my bunkmate, One-Eye Todd. Well they haven’t called yet. My guess is they’re not in the office but busy focusing on their advertising efforts. And let’s face it, there are a lot of piss-covered light poles in this city.